How Many PSI Does It Take To Inflate a Car Tire? What Does 300 PSI Mean? What Is The Most Quiet Air Compressor? How Do You Read a Tire Pressure Gauge? How Does a Tire Gauge Work? How Do I Know If I Need To Put Air In My Tires? How To Choose The Best Inflator? Traveling in a vehicle is a nice thing until it gets a flat tire in the middle of nowhere. The temperature fluctuations, among other factors, can also affect the air pressure in the tire. All that said, you need the best tire inflator to rescue you in the times of trouble. With the years of experience I possess, I have actually gone through a myriad of tire inflators and thus well rounded with their specific features. In this guide I will provide you the best tire inflator on the market as well as the buyer’s guide. Without further ado, let’s delve into the products below to sort out the very best tire inflator. Audew’s portable and powerful tire inflator reduces trips to the filling station to inflate the tires. It is an indispensable air compressor for car, motorcycle and bicycle owners. The tool’s design and performance are impressive, and so it is worth the price of money. Let’s check some of its parameters to see if it is really worth your consideration. Starting with performance, I would rate Audew Cordless Hand Held Air Compressor 9 out of 10 for its impressive performance. Don’t be fooled by its compact size and think it’s incapable of filling your tires. With a maximum pressure of 150Psi, it can inflate a broad range of vehicle tires. Further, it comes with a digital display wherein you can configure how it outputs the pressure. You will see the buttons to increase or decrease the pressure by pressing the + and – signs. Alongside the pressure reading, there is a preset value. That said, there is no need to worry about putting too much pressure as the air compressor will shut off automatically once the desired pressure value has been reached. In just 10 minutes, it can inflate from 0 to 35Psi; this reflects how fast the device is in inflating your tires. Important: do not use this air compressor for more than 15 minutes at a time. Let it cool first before you can reuse it. Moreover, avoid exposing the tool to unfavorably high temperatures or humidity. Even its battery should be safely handled. The design of this air compressor is portable and compact. It is cordless, so no need to worry about tangling cables to the wall outlets. It works on a Li-ion battery which is rechargeable. Alternatively, you can connect the tool on the 12V cigarette outlet. Make sure you keep your car on as this device can consume more of your battery. At first glance, you would mistake the tool as one of the power tools. You’re forgiven if you thought so. It comes in a black and red aesthetic appearance, which I find very eye-catching. Audew cordless air compressor is easy to use even by an amateur. Its digital configurations are straight-forward. The pressure units come in 4 variances to choose from by a tap of a finger on the LCD. If you are used to kg/cm2, KPA, Psi or bar, you may choose by pressing the M button. The tool comes with the hose which is about 180mm to connect to your tires. To connect to an external power supply, the cable is provided and it is about 3000mm long. Furthermore, you can adjust the pressure with ease using the + or – buttons. All these make it user-friendly to operate this air compressor. Audew’s air compressor brings the best value for money. It costs less, so it won’t break your bank. 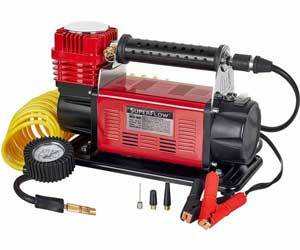 It’s rare to find such a multifunctional air compressor at such a reasonable price. It will save you trips to the filling station. 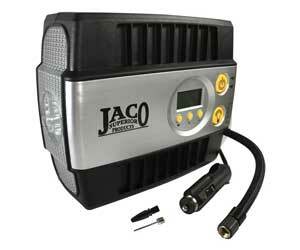 Given its performance and design, I would recommend this tire inflator to all car, motorcycle and bicycle owners. It is portable and cordless, so tire inflating will be so much easy. Besides, it is affordable as well. Just make sure you read the safety instructions properly to avoid any accidents. 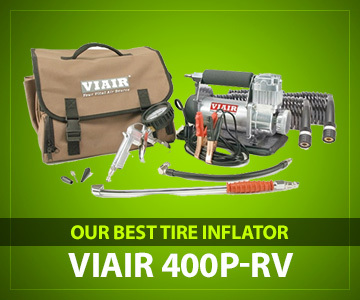 Viair provides us with a compact and portable tire inflator that is capable of inflating a variety of inflatable products. It comes with accessories to attach to the products such as the RV tires, sports equipment or trailers. The maximum pressure it has is 150 pounds per square inch (PSI). With this max PSI, it can inflate tires of different sizes. I got impressed with its 33% dual cycle because it takes less time to cool down before you can use it again. The device can be used up to 40 minutes nonstop thanks to its duty cycle. While it is designed for tires, it can also be suitable for longer trailers since it has the primary and the extension hose totaling 90 feet. It’s a cinch to connect both the primary and the extension hose. The power cord is 8 inches and the air hose is 60 inches; isn’t that convenient enough to access all tires? Of course it is! If you’re used to the inflation gun at the filling station this unit resembles it. It has the integrated pressure switch and a gauge to make the inflation an absolute breeze. When empowering it, you can either connect it to the car’s 12-volt or directly to the battery using the clamps. And when inflating the tires, there is no need to manually observe the pressure reading as it allows you to preset it. It will then shut off once the desired pressure has been reached. And, furthermore, if you’re switching from one tire to the other, you don’t have to manually switch off the unit as it features an automatic shut-off. Its vibration resistant helps you to in control of the unit without holding onto it. Some units can run into the road because of the vibration. Also worth noting is the quick turnaround of inflating the tires. What we need is a fast inflator to take us back to the road quickly. Because of the option to connect it directly to the battery terminal, it can take less than a minute to inflate the tires from 80 to 90 PSI. Just beware of the metal components as this tire inflator can get really hot, especially when used after a long time. Durability wise, the metal components help extend it. Lest I forget, the inflator also features the 90° twist-on chunk and the 45° extended reach chunk for the convenience of rear wheels. Now, do I recommend this product? Absolutely I do! It caters for a maximum PSI of 150 and comes with RV accessories. This makes it an ideal inflator to inflate lots of tires. It actually takes less time to inflate a single tire. I also embrace its additional features such as an automatic shut-off when you reached a desired pressure or moving from one tire to the other. Designed for the trucks, RVs, SUVs and tractors, SuperFlow 12V is an ideal tool to have during all your travels. It is powerful enough with a working pressure of 150 PSI and a restart pressure of 90 PSI to inflate many tires. A 37-in tire can be inflated in less than 2 minutes. That’s how quick the unit is although lacking with the turnaround time compared to the first product above. The base plate is rugged to enhance the durability of the inflator. With the 24 feet coiled hose you can reach all the vehicle tires with ease, and the inline pressure gauge helps you measure the vehicle specified air pressure. Please do not be deceived by the maximum pressure on the tire, but consider the auto manufacturer’s specifications. To power this inflator, you can connect it to the car’s battery using the clamps or connect it to the car’s 12V. It’s one of the high-performing tires with a maximum air flow of 6400 cubic inches per minute. This air compressor is effective for tires over 35 inches. When compared with the MV-89, it inflates faster because it connects directly to the battery terminal. Considering its features, I would recommend this tire inflator for those traveling in big guys such as SUVs and trucks. But, compared to the Viair inflator reviewed above, I will still recommend the Viair because it has good features than this one. What entices me with this one is that the price is affordable. Nobody wants a tire inflator that makes noise like a faulty motorbike. Thanks to the Campbell Hausfeld for its low noise operations as the company has invested more on noise reduction for your convenience. You also do not need to continually maintain or apply any oil to this component. It works effectively with the vehicle voltage. With its dual piston, it will inflate your tires in a short period of time with the max working pressure of 125 PSI. But always keep in mind the max air pressure for the vehicle as prescribed by the manufacturer. Not only is this inflator user-friendly but it is portable with the soft-grip steel handles to move it.Unlike others, it is backed by a one year warranty. One note though, it doesn’t come with the air hose. Only the paperwork and the compressor are included. That could be inconvenient to those accustomed to using air hoses especially to reach all the tires on your car and the trailer. Nonetheless, it is still a good tire inflator to consider. I do recommend it for those looking for quieter tire inflators. It is a relatively high-performing tire inflator, but wouldn’t recommend it over the above models reviewed. Its lack of the air hose can be a drawback to others. As in the name, it is a heavy duty tire inflator for car travelers. Driving to the filling station because of a flat tire is a yesterday habit because of a compact and portable Slime tire inflator to rescue you. Its “heavy-duty” description is triggered by its dual cylinder and its performance to inflate a tire in less than 2 minutes. With the air hose of 30 feet, it can reach all the tires. And to avoid over-inflation, the integrated gauge helps you preset the desired pressure as per the manufacturer’s specifications. To power the inflator you need to connect it to the battery and this optimizes its turnaround time compared to the inflator that is attached to the vehicle’s 12V. You do not need to be an expert to use the inflator as its user manual explains explicitly. All you need is to set the dial gauge which can be set from 0 to 150 PSI. If you get the flat tire in low light conditions, the bright LED will help you to visualize the dial gauge. It can also help to alert other drivers of the car in the sideways. The thermal break and direct drive motor prevents overheating. The duty cycle of 50% is also impressive. You just need to apply the inflator as the manual has instructed such as 15 minutes off and 10 minutes on. Traveling is easy with the carry case included. I would recommend this product especially to the budget-constraint users. It is a chap model and a fairly high-performing inflator. But its hose is not long enough. I just wish the manufacturer had included the extension cord just like the Viair above. Appearing in eye-catching green and black color, this compressor starter kit is ideal for standard tires. PowRyte Air Compressor is versatile, so it can be used for other inflatable products other than you vehicle. The 2.2 SCFM enables its quick recovery while the 135 PSI helps us to drive more nails. The compressors vertical pancake tank has a capacity of 3 gallons. The designer provided us with a unique design to enhance its portability. There is an extension cord to reach out to other wheels with ease. And the low Amp 120-volt helps the compressor to start with ease in unfavorably cold weather. I might say the 22 lbs is a good and portable weight to move the unit from one car to the other. You need not worry about the maintenance of this electric air compressor. Not even with the application of oils should you worry. Moreover, it’s easy to set the pressure gauge to the desired specification to avoid over-inflation or overheating. With a cut-in pressure of 100 PSI and the cut-out pressure of 135 PSI, I do recommend this air compressor for anyone looking for a portable yet performing tire inflator. Its price is also affordable. The compressor is furthermore versatile as it comes with accessories for air dusting, tire inflating, airline connection and pressure checking. Here’s another model from Viair but a smaller version than the first product in our list above. It was designed to cater for small ATVs, SUVs, trucks and generally small vehicles. Despite being designed for small cars, it is a good performing tire inflator and could be the rescuer in your long distance travels. It comes with a maximum working pressure of 120 pounds per square inch. The unit is portable and versatile. You do not need a wall socket to power it as the car’s 12 volt is sufficient. When connecting this air compressor to your car, just make sure that the engine is running because it can drain your battery intensively. 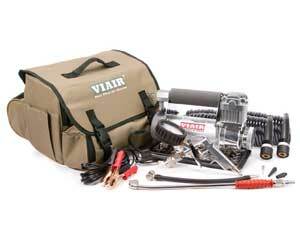 With this Viair 88P, you can inflate up to 33-inc tires. The inflation can be quite longer when you connect it directly onto the battery using the terminal clamps provided. Its 16 feet air hose and the 10 feet power cord are long enough to reach out to all the tires. In case you stuck at night with a flat tire, it is still convenient to use the air compressor since it has the LED/Power indicator. Those driving small cars and looking for a portable and affordable tire inflator, I would unhesitatingly recommend this one. It is compact and portable. Not only can you inflate flat tires, but can also check them before you take every trip. You cannot afford to face the disastrous travel of a flat tire as it can expose you to life-threatening accidents on the road. Costing less than $50, this unit is the best affordable tire inflator to rescue your flat tires. Among its features I like how portable it is. I mean the goal of these inflators is to reduce the bulkiness found in traditional inflators found at the filling stations. Also eye-catching is the smart pressure technology that helps you preset the desired PSI level. Then the inflator will automatically shut off once that level has been reached. With this inflator you can inflate standard tires up to 45 PSI. This could be too low for heavy tires of trucks and SUVs. The bikes can be inflated up to 100 PSI. Comparing it with analogs inflators, this one has more precision. Thanks to its bright LCD display to help you see the digital air gauge at night. The unit inflates at a rate of 25L/min. When powering it, you can connect its 10-inch cord to a 12-vold DC outlet of the car. It comes with a 24-inch air hose to reach all the tires and this hose features the twist connect nozzle for a hands-free operation. If you want to inflate the camping mattresses or sport balls, there are two adaptors included. Should the inflator show any faults within 12 months, the manufacturer offers a 12 month warranty. Talking about durability, the inflator was designed with components of a premium quality. It will occupy only little space since you can easily store the power cord and the air hose in its internal storage. And when traveling with it, there is a carry bag included for free. If you like traveling to the wilderness with sleeping bags, this small electric air pump can be suitable. It also caters for sport balls, motorbikes and bikes in addition to small cars. That’s a multifunctional tire inflator I found convenient. It has a digital tire gauge so that you can set your vehicle’s specified PSI level. Meanwhile the microprocessor will keep monitoring the tire pressure. It’s easy to read the digital tire gauge during the night thanks to the LED light. This will ensure that you do not put low pressure or too much pressure than it is required. The maximum working pressure is 150 PSI. Please do not make a mistake by misinterpreting the max pressure on the tire as the one suitable for your car. Check the vehicle’s specifications. I admire the triangular design with the soft PVC to prevent vibration during operation. This triangular design provides stability when inflating the tires. To reinforce its quality, high quality materials are used so this unit will last you for many years. It features a 3m power cord to connect to the 12-volt DC outlet. The accuracy is approximately 1 PSI and it inflates tires faster than many models in its league. I would recommend this inflator. It is ideal for travel arrangements where you need to inflate your sport balls or sleeping mattresses. The device was designed with small cars in mind. It is small but high-performing a maximum pressure of 150 PSI and multifunctional features. When traveling we want compact tools that will not occupy excessive space in our cars. This inflator is an ideal compact air compressor pump. How about its effectiveness? It’s a good inflator with many features. The unit operates easily by connecting to the vehicle’s cigarette lighter outlet. The power is enough to inflate a mid-sized car tire in 3 and half minutes. The working pressure max is 100 PSI. The inflator components are of high quality, so this enhances its durability. Just beware of the metal components as they can get very hot. When using it at night, it has bright LEDs with 3 settings to help you see. This can also help in emergencies where you have to alert the other motorists of your presence in the middle of the road. What I also like is the accessories that the unit has. These make it a versatile inflator for bikes, motorcycles, small SUVs, cars, etc. It is, however, not suitable for trucks as it is a small air compressor. Exclusive to the inflator is the digital guide to help you on how to care for this unit. In addition, the carry case has been provided to help you travel with the inflator. Do I recommend it? Oh, yes I do recommend it for small cars and whole host of other inflatables such as bikes, motorcycles, camping equipment and sport balls. It is one of the affordable inflators under $50. With just under $50, you will be able to own this portable tire inflator made by Campbell Hausfeld. it has a smart technology where it can shut off automatically when a desired PSI level has been attained. This feature prevents overpressure. Bear in mind overpressure and under-pressure are both detrimental to your tires. To activate this auto shut-off, you have to set the required PSI level on the digital display on the unit. The max working pressure is 100 PSI, so it’s not powerful enough for heavy tires. When filling a 195/65 R15 tire from flat to 35 PSI, it takes 4 minutes. This is enabled by the power through the 12-volt DC outlet of the car. The digital interface features the integrated LED for nighttime view and for emergencies. That’s a feature void in other inflators. We also have to embrace the versatility of this unit in other inflatable products such as bikes and motorcycles. There is the sports needle to inflate the sport equipment such as the volleyballs, rugby balls or the football. Camping equipment is also an inclusion in the versatility of this inflator. The inflator refers to a one-hand operated air pump used to inflate tires. We have conventional inflators found at the filling station as well as the mobile and portable ones reviewed in this article. The inflator can be used to inflate more inflatable products such as sport and camping equipment. Each vehicle is made different and each manufacturer has its own specifications. The amount of PSI (pounds per square inch) is determined by the manufacturer’s specifications not what is being displayed on the tire as maximum air pressure. The max air pressure on the tire might say 100 PSI but then find out the tire needs only 70 PSI as per specifications. Please note that overpressure is detrimental to the traction of your car. It is important to understand the PSI values. PSI refers to pounds per square inch and it is used to measure the pressure. It measures the amount of force in a given area. Note that the force is directly proportional to the pressure but the area is inversely proportional to the pressure. So 300 PSI means 300 pounds per square inch. Compressors are generally noisier. But manufacturers are putting more efforts to provide the reduced noises. On average, the noise levels can range from 40 to 92 decibels. The lower the decibel is the quieter the tire inflator. To read the tire pressure gauge, remove the valve cap from your vehicle tire and then fit the pressure gauge. Some pressure gauges can be analog while other digital. After putting it onto the valve, push a button on the gauge which will then provide the reading. Analog reading is not as precise as digital reading. It works just like other pressure gauges. The pressure from the pressure gauge will enter through the valve of your tires and start to expand until a desired PSI has been reached. Every car comes with its specifications as already stated. Usually, these specifications are printed on the side door of the driver or the glove box or fuel door. Use the portable inflator to check the air pressure and compare against the specifications. Typically, you should at least check the tire air pressure once a month or anytime before you embark on long journeys. These inflators come with different features. Of foremost importance, you need to consider portability, inflation time; power cord and air hose length, maximum pressure and accessories that can help you inflate other inflatable products. Note that some are suitable for heavy cars whereas others are for small cars. We have come to an end of our best tire inflator guide. We saw how multifunctional these products are in inflating cars, sport equipment and camping equipment. Just make sure you choose the right model among these 10 products. The bottom line is that they are indispensable to every car owner. The tire can deflate anytime in the middle of nowhere. With this portable tool you will be able to embark on your journey without the need to drive to the nearest filling station. Take note of the features as you select. For instance, other inflators come with auto shut-off feature while some do not. Be familiar with the PSI values so that you select the best tool. Under-pressure and overpressure can both be bad for your tires. Now you’re all set to choose the very best tire inflator for you. Drop me a comment if anything.